I wanted my first post to be an Eggs Benedict recipe, because I think it is one of the most wonderful dishes ever invented by man. I love the drama of the stacked ingredients, the variations in texture, from crunchy to creamy, and of course the buttery, lemony Hollandaise Sauce that marries all of the components in delicious synergy. I wanted to make the Eggs Benedict to my own liking, as I’m not that enthralled with the traditional English muffin, so I decided to do a little potato pancake instead. I thought for the photo that the salmon was more picturesque than a slice of Canadian bacon, and that the egg should be cooked in a form, rather than in simmering water. I really don’t like those stringy little wisps of egg white you get when poaching in water, not to mention a third of the egg is wasted, and you get a shapeless blob of egg which may or may not have a runny yolk. After cooking the Eggs Benedict, photographing it, and then devouring it, I was working on my computer with the photo and so forth, and I decided to do a Google search on my dish. The first site to pop up was Wikipedia, which has a nice little history of who invented E.B., plus a list of about 25 interesting variations. The second site brought me to Google Images. I almost fell off my chair, I was laughing so hard. My search returned 383,000 images of Eggs Benedict. Well, so much for the originality of my first post. But at least I’m doing a dish that is, to say the least, broadly popular. I reviewed about 200 of these photos, and came to the conclusion that there are two schools of thought about how to cook the egg for E.B: 1) Mine, cooked in a form; and 2) everyone else, poached in water. I didn’t see one photo that remotely looked like mine. How about you – form or water? There are several claims to the origin of Eggs Benedict. Some say it originated in the 1890’s in New York, perhaps at Delmonico’s or the Waldorf Hotel. Or it may be a variation of a French dish named oeufs bénédictine that had salt cod, fried bread, egg and Hollandaise, which may go as far back as the Renaissance. Hollandaise Sauce has been around even longer. France’s first great culinary writer, Pierre La Vareme, chef to Henri IV, wrote of an egg and butter emulsified sauce in his cookbook Le Cuisinier in 1651. I think you could say, after more than 350 years, that this dish has seen the test of time. The potato pancakes in this recipe are a very simple variation. I took half of a large Idaho Classic Russet Potato and grated it on the large holes of a box grater into a medium bowl. I sprinkled on some salt and pepper, mixed it up with my fingers, and formed it into three patties about the diameter of an English muffin. I sautéed them in some butter until brown and crisp on the outside, and soft and creamy on the inside. The salmon was sautéed in butter also. That’s what gives it that mouth-watering sheen. The chives were added for color and whimsy. The eggs were cooked in a pan, over water, covered, in a three-well egg poacher. You can poach them directly in the water…go ahead, I’ll just look the other way. 1. In the top of a double boiler or in a medium bowl set over a pot of barely simmering water, whisk the egg yolks with the lemon juice and 2 teaspoons of water until the egg yolks are thickened and pale yellow, but still liquid. 2. Remove double boiler, or bowl and saucepan, from the heat and gradually add the butter, whisking constantly to thicken. 3. Add warm water or additional lemon juice, as needed, to thin to pouring consistency. Congratulations, Lynne! Your website looks amazing. 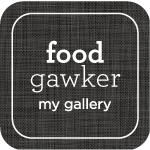 What an inspiration for cooks, food lovers and photographers alike. It was very nice meeting you at photography class. Best of luck to you! Congrats Lynne! 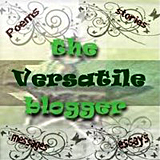 This is a fabulous beginning to an exciting journey for you. I will be following along, for sure. Your food looks truly amazing. Not only you’re making me instantly hungry, but also you’re inspiring me to work on my photography. I’ll be coming back for recipe ideas. You go girl! Great looking design and recipes that sound delicious. Can’t wait to try the Eggs Benedict! Mrs. LeGrand would roll in her grave! – what blashphemy! 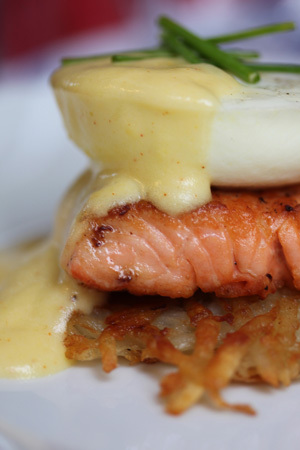 I never would have imagined salmon with eggs Benedict (my favorite egg dish by the way! ), but what a tasty idea! The lemon in the sauce would totally compliment the fish nicely. I look forward to trying your recipe soon. Hi, I agree with you about the form. I also don’t like the taste of vinegar on the eggs. I use a rubber mold I found at Sur la Table and spray the inside with cooking oil before I crack the egg into it. Simmer water with 3 or 4 molds for 3-4 minutes. Yum. I like your potato pancake idea, too!